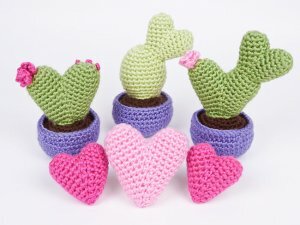 Heart Cactus Collection is an original crochet pattern by June Gilbank. This pattern includes full instructions to make three styles of heart-shaped cactus in lovely rounded pots. It also includes patterns for matching 3-dimensional hearts in two sizes. Perfect for your Valentine, or to show someone you care at any time of year. Date Added: 02/15/2017 by Judy C.